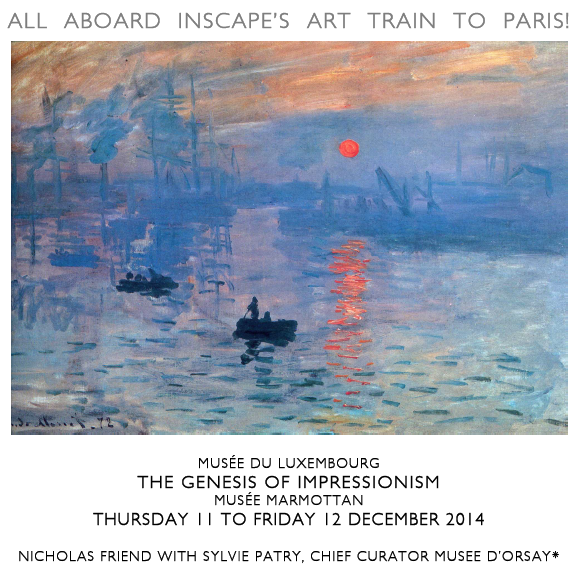 *Sylvie Patry is Chief Curator of Impressionist and Post-Impressionist Paintings at the Musée d’Orsay, Paris. She is the co-curator of the Musée du Luxembourg exhibition on Durand-Ruel (collaborating with the National Gallery, London and the Philadelphia Museum of Art). She has co-curated international exhibitions on Maurice Denis, Hodler, Renoir, Orsay’s Masterpieces and, significantly for us, the Monet exhibit at the Grand Palais, INSCAPE ‘s first Art Train event in 2011. She is the author of various publications on Denis, neo-Impressonism and Fantin-Latour published by the Musée d’Orsay (including, Renoir, Van Gogh, Gauguin, Cézanne and Beyond: Post-Impressionist Masterpieces from the Musée d’Orsay, and the Editor of Inventing Impressionism, Paul Durand-Ruel and the Modern Art Market). In 1874, when the sublime painting, Impression, Sunrise by a young Claude Monet was first exhibited in the cavernous Parisian studio of the photographer Nadar, leading journalist and art critic for Le Charivari, Louis Leroy, dismissed it as “impressionistic,” a term he lifted from the painting’s title. Not stopping there, he went on to say, “A preliminary drawing for a wallpaper pattern is more finished than this seascape.“ However, his remark proved more prescient than pejorative as the term became a clarion call to the public that a major and enduring shift had taken place in the way visual reality was perceived and depicted in paint. The painting hangs today in Paris at Musée Marmottan as the nucleus of the largest collection of Monet’s work in the world, and, now, as the focal point of its 140th anniversary exhibition. Without fanfare, even without publicity in the English press, this innovative exhibition superbly traces the genesis and influence of this single iconic painting. The resulting display is simply one of the most probing and perceptive exhibitions ever held on Impressionism. Through these exhibitions and related activity, INSCAPE explores the primal role played in the launch of Impressionism by the intercession of two hugely influential individuals: Georges de Bellio, an early supporter and collector of Impressionist work, and Paul Durand-Ruel, a Paris art dealer who after setting up a gallery in London, and subsequently meeting Claude Monet, featured Impressionist work in his first major exhibition in his gallery at 168 New Bond Street. Georges de Bellio, an aristocratic Romanian physician, tended to the medical and financial needs of many of the Impressionist artists and collected their work in lieu of payment, he could always be counted on to revive their flagging resources. His unique collection of their paintings forms the core of the work at Musée Marmottan and features in the Impression, Sunrise exhibition. Paul Durand-Ruel, the second saviour of Impressionism, is, at last, the subject of an exhibition at the Musée du Luxembourg. Standing by the Impressionists from their early days, he believed passionately in their talent when few others did. He was hugely instrumental in securing their legacy. Renoir affectionately referred to him as the Impressionists’ ‘missionary’. By the early 20c he had established the largest collections of French and American Impressionists in the world. Some 80 paintings, drawings, photographs and documents are in this ground-breaking exhibition, many of them never seen before. COST £315 Members, £340 non-Members. The tour includes two days’ tuition, one private curatorial tour, all entry fees, one lunch with wine, tea and cake, all metro tickets/taxis when necessary, gratuities and VAT. Please note your accommodation, dinner and Eurostar are not included (see below). HOTEL Nicholas will be staying at the Hotel de Sèvres, 22 Rue de l’Abbé Grégoire, 75006 +33 1 45 48 84 07. We have reserved some rooms for INSCAPE participants and would be happy to book your accommodation. The extra £130 (single occupancy) and £140 (double occupancy), per room, per night, including breakfast, can be applied to the base cost.